The bitcoin price is crashing, and naysayers and doomsayers are having a field day. The demise of the dominant cryptocurrency is finally happening—or is it? Bitcoin has been buried hundreds of times, most notably during the brutal 90 percent decline from 2013 to 2015. And yet, it has always made a comeback. Where the skeptics are correct: The second bitcoin bubble burst in December 2017 and the price is down roughly 80 percent from its high of $20,000. Nobody knows whether and when it will see these lofty heights again. What most speculators and even some serious proponents of the independent and decentralized monetary system don’t understand is that bitcoin needs these pauses to make improvements in its infrastructure. Exchanges, which couldn’t handle the trading volumes at the height of the frenzy and didn’t return customer-service inquiries, can take a breather and upgrade their systems, and hire capable people. The technology itself needs to make progress and this needs time. Projects like the lightning network, a system that delivers instant bitcoin payments at very little cost and at virtually unlimited scale, is now only available to expert programmers. A higher valuation is only justified if these improvements reach the mass market. And since we live in a world where everything financial is tightly regulated, for better or worse, this area also needs to catch up, since regulators are chronically behind the curve of technological progress. And of course, there is bitcoin mining. The vital infrastructure behind securing the bitcoin network and processing its transactions has been concentrated in too few hands and in too few places, most notably China, which still hosts about 70 percent of the mining capacity. Critics have always complained that bitcoin mining consumes “too much” electricity, right now about as much as the Czech Republic. In energy terms, that’s around 65 terawatt hours or 230 million gigajoules (GJ), costing $3.3 billion, according to estimates by Digiconomist. For the non-physicists among us, this is about as much as consumed by six million energy-guzzling U.S. households per year. All those estimates are imprecise because the aggregate can’t know how much energy each of the different bitcoin miners consumes and how much that electricity costs. But they are a reasonable rough estimate. So it’s worth exploring why mining is necessary to begin with and whether the electricity consumption is justified. Anything and everything humans do consumes resources. The question then is always: Is it worth it? And: Who decides? This question then leads to the next question: Is it worth having and using money? Most people would argue yes, because using money instead of barter makes economic transactions faster and cheaper and thus saves resources, both natural and human. If we are generously inclined, we will grant bitcoin the status of a type of money or at least currency, as it meets the general requirements of being recognizable, divisible, portable, durable, is accepted in exchange for other goods and services, and, in this case, it’s even limited in supply. So having any type of money has a price, whether it’s gold, dollar bills, or numbers on the screen of your online banking system. In the case of bitcoin, it’s the electricity and the capital for the computing equipment, as well as the human resources to run these operations. If we think having money, in general, is a good idea and some people value the decentralized and independent nature of bitcoin, then it would be worth paying for verifying transactions on the bitcoin network, as well as keeping the network secure and sound: Up until the point where the resources consumed would outweigh the efficiency benefits. Just like most people don’t think it’s a bad idea to use credit cards and banks, which consume electricity too. However, bitcoin is a newcomer and this is why it’s being scrutinized even more so than the old established players. How many people know how much electricity, human lives, and other resources gold mining consumes or has consumed in the course of history? What about the banking system? Branches, servers, air-conditioning, staff? What about printing dollar notes and driving them around in armored trucks? What about the social effects of monetary mismanagement of bank and government money such as inflation as well as credit deflations? Gold gets a pass here. Most people haven’t asked that question, which is why it’s worth pointing out the only comprehensive study done on the topic in 2014. In “An Order of Magnitude,” the engineer Hass McCook analyzes the different money systems and reaches mind-boggling conclusions. The study is a bit dated and, of course, the aggregations are also very rough estimates, but the ballpark numbers are reasonable and the methodology sound. In fact, according to the study, bitcoin is the most-economic of all the different forms of money. Gold mining in 2014 used 475 million GJ, compared to bitcoin’s 230 million in 2018. The banking system in 2014 used 2.3 billion GJ. Over 100 people per year die trying to mine gold. But mining costs more than electricity. It consumes around 300,000 liters of water per kilogram of gold mined, as well as 150 kilograms (330 pounds) of cyanide and 1,500 tons of waste and rubble. The international banking system has been used in all kinds of fraudulent activity throughout history: terrorist financing, money laundering, and every other criminal activity under the sun at a cost of trillions of dollars and at an order of magnitude higher than the same transactions done with cryptocurrency and bitcoin. And of course, while gold has a relatively stable value over time, our bank and government-issued money lost about 90 percent of its purchasing power over the past century, because it can be created out of thin air. This leads to inflation and a waste of physical and human resources because it distorts the process of capital allocation. This is on top of the hundreds of thousands of bank branches, millions of ATMs and employees which all consume electricity and other resources, 10 times as much electricity alone as the bitcoin network. According to monetary philosopher Saifedean Ammous, author of “The Bitcoin Standard,” the social benefit of hard money, i.e. money that can’t be printed by government decree, can’t even be fathomed; conversely, the true costs of easy money—created by government fiat and bank credit—are difficult to calculate. According to Ammous, bitcoin is the hardest money around, even harder than gold because its total supply is capped, whereas the gold supply keeps increasing at about 1 to 2 percent every year. “Look at the era of the classical gold standard, from 1871, the end of the Franco–Prussian War, until the beginning of World War I. There’s a reason why this is known as the Golden Era, the Gilded Age, and La Belle Epoque. 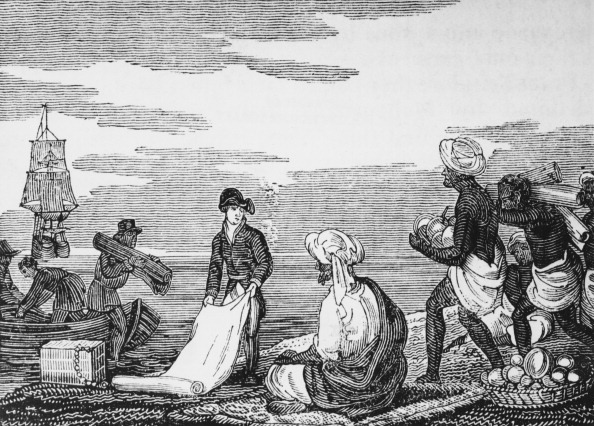 It was a time of unrivaled human flourishing all over the world. Economic growth was everywhere. Technology was being spread all over the world. Peace and prosperity were increasing everywhere around the world. Technological innovations were advancing. “I think this is no coincidence. What the gold standard allowed people to do is to have a store of value that would maintain its value in the future. And that gave people a low time preference, that gave people the incentive to think of the long term, and that made people want to invest in things that would pay off over the long term … bitcoin is far closer to gold. It is a digital equivalent of gold,” he said in an interview with The Epoch Times. Of course, contrary to the gold standard that Ammous talks about, bitcoin doesn’t have a track record of being sound money in practice. In theory, it meets all the criteria, but in the real world it hasn’t been adopted widely and has been so volatile as to be unusable as a reliable store of value or as the underlying currency of a productive lending market. The proponents argue that over time, these problems will be solved the same way gold spread itself throughout the monetary sphere replacing copper and seashells, but even Ammous concedes that the process may take decades and the outcome is far from certain. Gold is the safe bet for sound money, bitcoin has potential. There is another measure where bitcoin loses out, according to a recent study by researchers from the Oak Ridge Institute in Cincinnati. It’s the amount of energy expended per dollar for different monetary instruments. One dollar worth of bitcoin costs 17 megajoules to mine versus five for gold and seven for platinum. But the study omits the use of cyanide, water, and other physical resources in mining physical metals. In general, the comparisons in dollar terms go against bitcoin because it is worth relatively less, only about $63.4 billion in total at the time of writing. An issue that could be easily fixed at a higher price, but a higher price is only justified if the infrastructure improves, adoption increases, volatility declines, and the network proves its resilience to attacks over time. In the meantime, market participants still value the fact they can own a currency independent of the government, completely digital, easily fungible, and limited in supply, and relatively decentralized. And the market as a whole is willing to pay a premium for these factors reflected in the higher per dollar prices for mining bitcoin. But where bitcoin mining lacks in scale, it makes up in creativity. Some miners are flocking to the heat of the Texas desert, where gas is virtually available for free, thanks to another oil revolution. Other miners go to places where there is cheap wind, water, or other renewable energy. This is because they don’t have to build bank branches, printing presses, and government buildings, or need to put up excavators and conveyor belts to dig gold out of the ground. All they need is internet access and a home for the computers that look like a shipping container, each one of which has around 200 specialized bitcoin mining computers in them. “The good thing about bitcoin mining is that it doesn’t matter where on earth a transaction happens, we can verify it in our data center here. The miners are part of the decentralized philosophy of bitcoin, it’s completely independent of your location as well,” said Moritz Jager, chief technology officer at bitcoin mining company Northern Bitcoin AG. But so far, this decentralization hasn’t worked out as well as it sounds in theory. Because Chinese local governments had access to subsidized electricity, it was profitable for officials to cut deals with bitcoin mining companies and supply them with cheap electricity in exchange for jobs and cutbacks. Sometimes, the prices were as low as 2 dollar cents to 4 dollar cents per kilowatt hour. This is why the majority of bitcoin mining is still concentrated in China (around 70 percent) where it was the most profitable, but only because Chinese central planners subsidized the price of electricity. This set up led to the by and large unwanted result that the biggest miner of bitcoin, a company called Bitmain, is also the biggest manufacturer of specialized computing equipment for bitcoin mining. The company reported revenues of $2.8 billion for the first half of 2018. They don’t have an incentive to do so because it would probably ruin the bitcoin price and their business, but it’s better not to have to rely on one group of people controlling an entire monetary system. After all, we have that exact same system with central banking; bitcoin was set up as a decentralized alternative. So far, no player or conglomerate ever reached that 51 percent threshold, at least not since bitcoin’s very early days, but many market participants always thought Bitmain’s corner of the market is a bit too close for comfort. This favorable environment for Chinese bitcoin mining has been changing with a crackdown on local government electricity largess, as well as a crackdown on cryptocurrency. Bitcoin itself and mining bitcoin remain legal in China but cryptocurrency exchanges have been banned since late 2017. But more needs to be done for bitcoin to become independent of the caprice of a centralized oppressive regime and local government bureaucrats. Enter Northern Bitcoin AG. The company isn’t the only one that’s exploring mining opportunities with renewable energies in locations other than China. But it is special because of the extraordinary setup it has for its operations, the fact that it’s listed on the stock exchange in Germany, and the opportunities for scaling it discovered. The operations of Northern Bitcoin combine the beauties of bitcoin and capitalism in one. 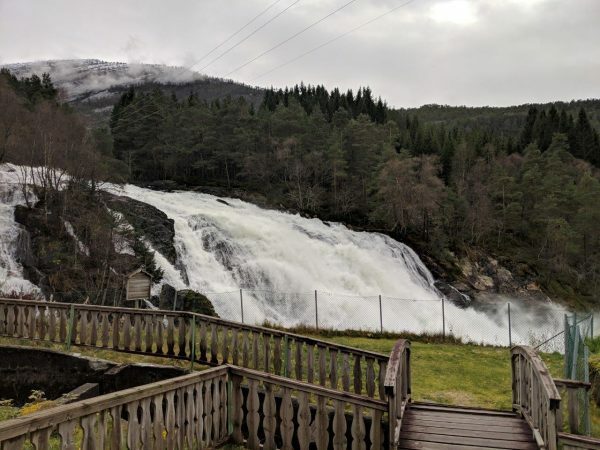 While Texas has a lot of oil and free gas and it makes sense to use the gas rather than burn it, Norway has a lot of water, especially water moving down the mountains, due to rainfall and melting snow. And it makes sense to use the power of the movement of the water, channel it through pipes into generators to create very cheap and almost unlimited electricity. Norway generates north of 95 percent of its total electricity from hydropower. 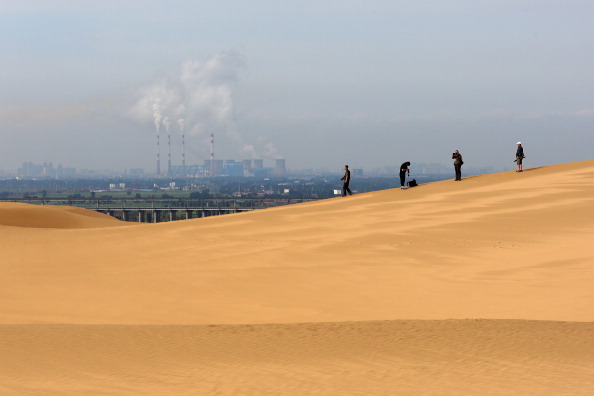 Capitalism doesn’t distinguish between renewable and fossil fuel. It uses what is the most expedient. In this case, it is clearly water in Norway, and gas in Texas. As a side note on the beauties of real capital and the fact that capital and the environment need not be enemies, the water in one of the hydro powerplants close to the Northern Bitcoin facility is piped through a generator made in 1920 by J.M. Voith AG, a company from Heidenheim, Germany. The company, established in 1867, is still around today. The generator was produced in 1920 and is still producing electricity. In the remote regions of northern Norway, there aren’t that many people or industry who would use the electricity. 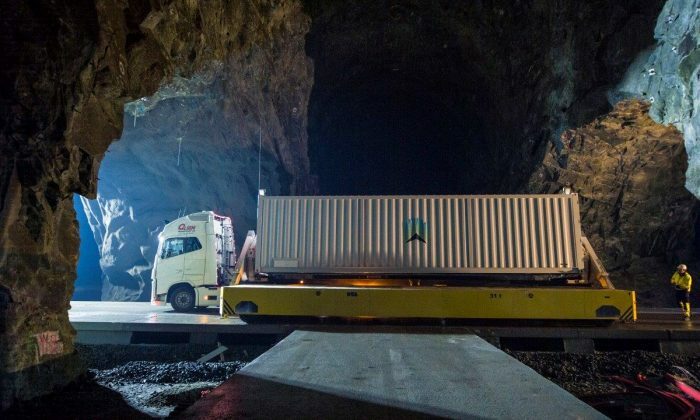 And rather than transport it over hundreds of miles to the industrial centers of Europe, the industries of the future are moving to Norway to the source of the cheap electricity. Of course, it isn’t just bitcoin mining, but other data and computing heavy operations such as server farms for cloud computing that can be neatly packaged into one of those containers and shipped up north. “The containers are beautiful. They are produced in the middle of Germany where the hardware is enabled and tested. Then, we put it on a truck and send it up here. When the truck arrives on the outside, we lift it on the container vehicle. Two hours after the container arrives, it’s in the container rack. And 40 hours later, we enable the cooling, network, power, other systems, and it’s online,” said Mats Andersson, a spokesman for the Lefdal Mine data center in Maloy, Norway, where Northern Bitcoin has its operations. If the cheap electricity wasn’t enough—around 5 cents per kilowatt hour compared to 17 cents in Germany—Norway also provides the perfect storage for these data containers, which are normally racked up in open air parks above the ground. Also here, the resource allocation is beautiful. 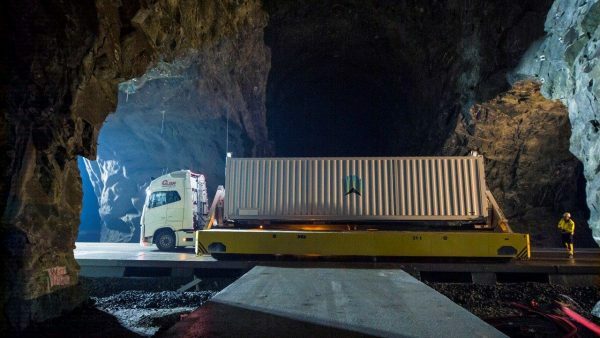 Instead of occupying otherwise useful and beautiful parcels of land and nature, the Northern Bitcoin containers and others are stored in the old Lefdal olivine mine. Olivine is a mineral used for steel production and looks green. Very fitting. Hence, also the name of the data center: Lefdal Mine. “We take the green mineral out and we take the green IT in,” said Andersson. 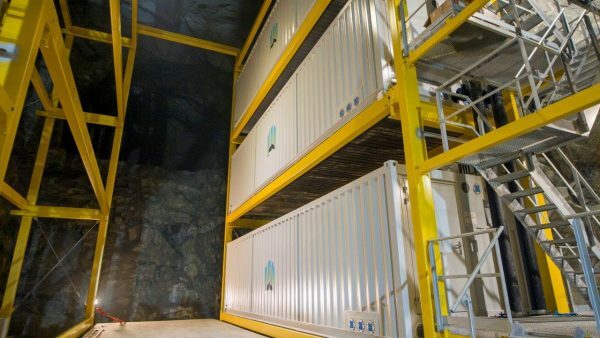 Using the old mine as storage for the data center makes the whole process even more resource-efficient. Why? So far, we’ve only been talking about bitcoin mining using a lot of energy. But what for? Before you have actually seen the process in action—and it is similar for other computing operations—you can’t imagine how bizarre it is. Most of the electricity is used to prevent the computers from overheating. So it’s not even the processors themselves; it’s the fans that cool the computer that use the most juice. This is where the mine helps, because it’s rather cool 160 meters (525 feet) below sea level; certainly cooler than in the Texas desert. But it gets even better. On top of the air cooling the computer, the Lefdal data center uses a fresh-water system to pump through the containers in pipes. The fans can then circulate air over the cool pipes, which transfer the heat to the water. One can feel the difference when touching the different pipes. 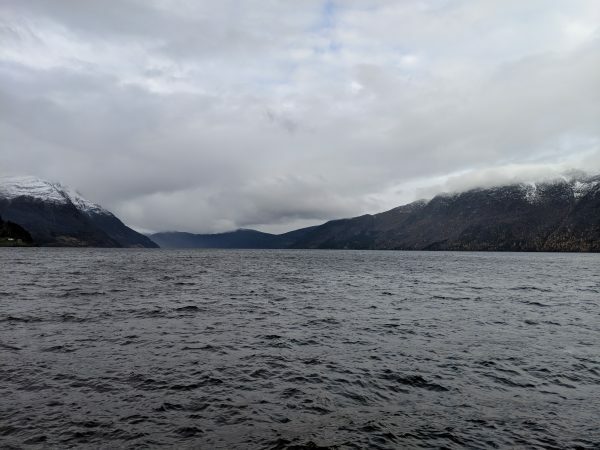 The fresh-water closed-circle loop then completes the “green” or resource efficiency cycle by transferring its heat to ice cold water from the nearby fjord. The water is sucked in through a pipe from the fjord, the heat gets transferred without the water being mixed, and the water flows back to the fjord, without any effect on the environment. To top it off, the mine has natural physical security far better than open air data centers and is even protected from an electromagnetic pulse blast because it’s underground. Given this superlative setup, Northern Bitcoin wants to ramp up production as fast as possible at the Lefdal mine and other similar places in Norway, which have more mountains where data centers can be housed. At the moment, Northern Bitcoin has 15 containers with 210 mining machines each. The 15 containers produce around 5 bitcoin per day at a total cost of around $2,500 dollars as of the end of November 2018, and after the difficulty of solving the math problems went down by roughly 17 percent. Most of it is for electricity; the rest is for leasing the containers, renting the mine space, buying and writing off the mining computers, personnel, overhead, etc. Even at the current relatively depressed prices of around $3,600, that’s a profit of $1,100 per bitcoin or $5,500 per day. But the goal is to ramp up to 280 containers until 2019, producing 100 bitcoin per day. Again, the company is in the sweet spot to do this. As opposed to the beginning of 2018 when one could not procure a mining computer from Bitmain even if one’s life depended on it, the current bear market has made them cheap and relatively available both new and second had from miners who had to cease operations because they can’t produce at low bitcoin prices. What about the data shipping containers? They are manufactured by a company called Rittal, which is the world market leader. So it helps that the owner of Rittal also owns 30 percent of the Lefdal mine, providing preferential access to the containers. Northern Bitcoin said it has enough capital available for the intermediate goal of ramping up to 50 containers until the end of the year, but may tap the capital markets again for the next step. The company can also take advantage of the lower German corporate tax rate because revenue is only recorded when the bitcoin are sold in Germany, not when they are mined in Norway. Of course, every small-cap stock—especially bitcoin companies—have their peculiarities and very high risks. As an example, Northern Bitcoin’s financial statements, although public, aren’t audited. 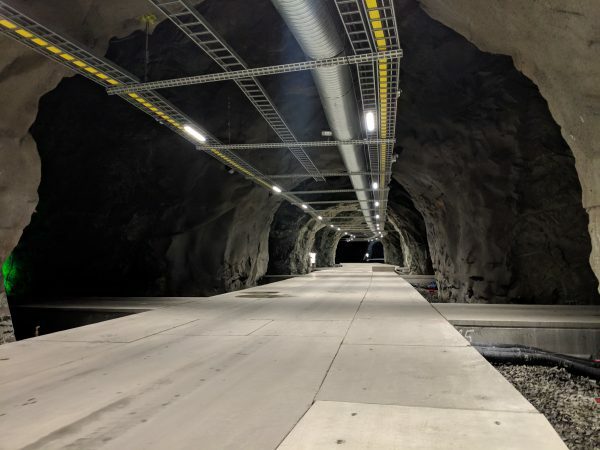 The equipment in the Lefdal mine in Norway is real and the operations are controlled by the Lefdal personnel, but one has to rely on exclusive information from the company for financials and cost figures, so buyer beware. Northern Bitcoin wants to have 280 containers, representing around 5 percent of the network’s computing power. But the Lefdal mine alone has a capacity to power and cool 1,500 containers in a 200-megawatt facility, once it is fully built out. “Here you have all the space, power, and cooling that you need. … Here you can grow,” said Lefdal’s Andersson. The Norwegian government was behind an initiative to bring computing power to Norway and make it one of the prime destinations for data centers at the beginning of this decade. To that effect, the local governments own part of the utility companies which operate the power plants and own part of the Lefdal Mine and other locations. But even without notable subsidies (i.e. cash payments to companies), market players were able to figure it out, for everybody’s benefit. The utilities win because they can sell their cheap electricity close to home. The computing companies like IBM and Northern Bitcoin win because they can get cheap electricity, storage, and security. Data center operators like Lefdal win because they can charge rent for otherwise unused and unneeded space. However, in a recent about-face, the central government in Oslo has decided to remove cryptocurrency miners from the list of companies which pay a preferential tax rate on electricity consumption. Normally, energy-intensive companies, including data centers, pay a preferential tax on electricity consumed of 0.48 ore ($0.00056). According to a report by Norwegian media Aftenposten, this tax will rise to 16.58 ore ($0.019) this year for cryptocurrency miners exclusively. Since Norway generates its electricity using hydro, precisely the opposite is true: No greenhouse-gas emissions, or any emissions for that matter would be produced if all crypto mining was done in Norway, as opposed to China, where mining is done with coal and with emissions. But not only in Norway is the share of renewable and emission-free energy high. According to research by Coinshares, bitcoins consume about 77.6 percent of their energy in the form of renewables globally. However self-defeating the arguments against bitcoin mining in Norway, the political initiative is moving forward. What it means for Northern Bitcoin isn’t clear, as it houses its containers in Lefdal’s mixed-data center, which also has other clients, such as IBM. “It’s not really decided yet; there are still big efforts from IT sectors and parties who are trying to change it. If the decision is taken it might apply for pure crypto sites rather than mixed data centers, like ours,” said Lefdal’s Andersson. Even in the worst-case scenario, it would mean an increase from about 5 cents to about 6.9 cents per kilowatt hour, or 30 percent more paid on the electricity by Northern Bitcoin, which at about $3,250 would still rank it among the most competitive producers in the world. Jager says Northern Bitcoin depreciates the equipment over three years and has obtained very favorable prices from Bitmain, making its production much more competitive than the average despite the same cost of electricity. In addition, the natural cooling in the mine also reduces electricity costs overall. At the moment, however, the tax could be the least of any miners worry, as the bitcoin price is in free-fall. But what happens when the price crashes further? Suffice it to say that there was bitcoin mining when the dollar price was less than 1 cent and there will be bitcoin mining at lower prices, thanks to the design of the network. Mao Shixing, the founder of mining pool F2pool estimated 600,000 miners have shut down since the November crash in price, according to a report by Coindesk. As it should be in a competitive system, the most energy intensive and obsolete machines are shut down first. As with every other commodity, when the price drops, some miners will leave the market, leaving space for cheaper competitors to capture a bigger share. But with bitcoin, this is a bit simpler than with copper or gold for example. When a big copper player goes bankrupt, its competitors have to ramp up production and increase cost to boost their market share. With bitcoin, if 3,000 computers get taken off the total mining pool, they won’t be able to mine the approximately 5 bitcoin any longer. However, because the difficulty of solving the computationally intensive cryptographic tasks of bitcoin decreases automatically when there are fewer computers engaged in the task, the other players just have to leave their machines running at the same rate for the same cost and they will split the 5 bitcoin among them. “The moment the price goes down, our production price will go down as well,” said Jager, a process that already happened from November to December, when the difficulty decreased twice in November and the beginning of December. This naturally favors players like Northern Bitcoin, which are producing at the lower end of the cost spectrum. They will be the ones who shut down last. And this is a good thing. The more companies like Northern Bitcoin, and countries like Norway—even with the extra tax—the more decentralized the bitcoin system. The more computers there are in different hands mining bitcoin, the more secure the system becomes, because it will be ever more difficult for one player to reach the 50 percent threshold to crash the system. It is this decentralized philosophy that’s kept the bitcoin system running for 10 years. Whether at $1 or $20,000. Disclaimer: Northern Bitcoin paid for the trip to visit the facilities in Norway.